Andy Black (Billy Elliot the Musical, Young Hearts Run Free) has teamed up with internationally renowned director Molly Molloy and composer Richard Gallagher to create a high-octane interactive theatre piece, journeying through new dimensions and magical realms to a pulsing soundtrack of trippy disco and cutting-edge house music. The Faun is an ancient archetype who taps into our wild nature, horniness and primal desire to dance. He is the Pied Pier…on acid…in heels. Combining dance workshop, shamanic journey and stand-up comedy, Follow the Faun leads audiences through a musical adventure of high-energy disco, musical theatre ballads, and hands-in-the-air raving. Audiences discover the power of dance, delight and their pelvic thrust – this is body-mind aerobics for the post-rave generation. Performer Andy Black trained at GSA Conservatoire. He then worked in West End musical theatre before developing the Faun and performing for thousands at festivals across the UK, including Glastonbury, Secret Garden Party, Shambala and Morning Gloryville. The Faun draws on these two worlds to create a new theatrical space – where ravers and clubbers meet traditional audiences for interactive storytelling and dance floor fun. Having invested years of training, experimentation, research and development, in 2015 Andy took a leap of faith and launched a crowdfunding campaign on Indiegogo. The goal was to raise the funds to take the show to Edinburgh Fringe and join thousands of other acts and shows in the worlds largest theatre festival. A strong, giving, nurturing and loving tribe stumped up enough cash to cover the venue and production costs. Follow The Faun was wildly successful, receiving all 5-star reviews, selling out shows, and gaining a cult following. The adventure continued in London at Dalston's progressive music venue, Passing Clouds, and is currently gearing up for its West End showcase at the Arts Theatre, London (May 2-7). The Faun at Secret Garden Party. 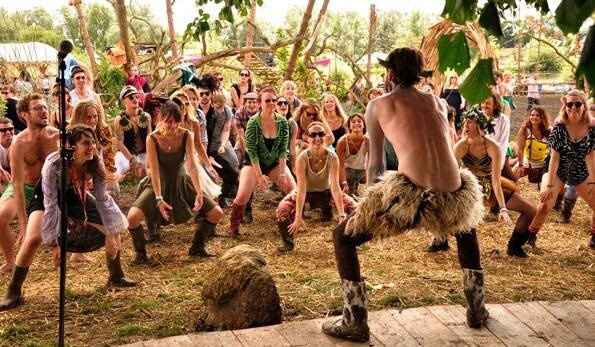 Thousands have witnessed the The Faun bring his powerful blend of dance, drama and laughter to the UK festival scene including Glastonbury, Secret Garden Party, Shambala, & Morning Gloryville. Many have attended his unique dance classes and workshops with Urdang, Onetaste and Artful Badger to experience the collective joy, healing and the ancient, tribal ecstasy which only those who truly Follow The Faun experience. Please support this exciting project and take advantage of the many participatory perks. This is a fully immersive adventure; supporters will have exclusive behind the scenes access, updates and the chance to help shape the story, songs and structure of an exciting new piece of theatre. "It was an extraordinary experience as every sense was drawn into the movement, sound, light and images of the show. Putting it into words can’t do this piece of performance art justice, so you had better go and experience it yourself." At The Vaults Festival as part of Artful Badgers Wild Worlds: Darksides, which won "Spirit of The Festival award 2015" Target Audience. We wish to attract a traditional theatre audience, who would not neccesarily have experienced a 'rave' situation and give them the experience of dancefloor unity, fun and physical freedom. We also aim to bring the ravers and clubbers into a theatrical context, to make live storytelling accessible and attractive as well as presenting dance & play as a healthy 'high'. 2016 will see appearances all over the globe with provisional dates already set in Ibiza, Berlin, Adelaide, New Zealand, Sydney, LA, San Fransisco & New York. Supporting this project will help to establish the show in a way that will help to create a sustainable future for the company and lead to the development of a large scale interactive musical. Entry into a monthly prize draw for tickets and gifts. Priority Booking for all shows. 2 complimentary tickets to every production. Sponsor a Living Wage apprentice. Placements are available on a 3, 6 & 12 monthly basis for those looking for experience working in theatre and events. 20 VIP Tickets to future Faun events, shows, gigs & productions. PLUS a performance booked for the charitable organisation of your choice. We have the music, we have the lyrics, we have the technology. 2 sessions in the studio recording mixing and mastering 3 songs from the theatrical production to broadcast quality. The results will be offered up to the DJ world for dance-floor and radio remixes and made available for purchase on vinyl & digital.